Just received my order from Mike first off one of the nicest guys I ever met! The box I received was jam packed with GOODIES! Thanks Mike. Aside from the great collection of seeds and fantastic pods which are delicious as well as Hot!! I received a great spice powder love the flavor will be posting a new rub recipe with it as the star!! 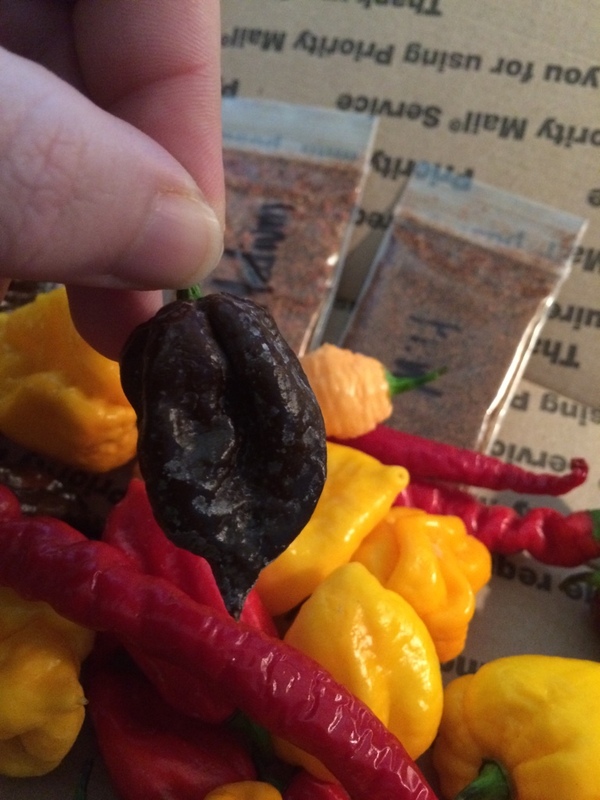 Then a package of brown Morugas that are crazy hot. As well as hickory smoked Fresno peppers that are going in my next ferment. And last but not least his spicy sunshine state syrup WOW WOW WOW is all I can say! Thanks again Mike and THP for supplying us with not only fantastic know how for are addiction but great vendors to help keep us well stalked AGAIN MIKE YOU ROCK!! The meek shall inherit the earth but the brave shall inherit the sea. 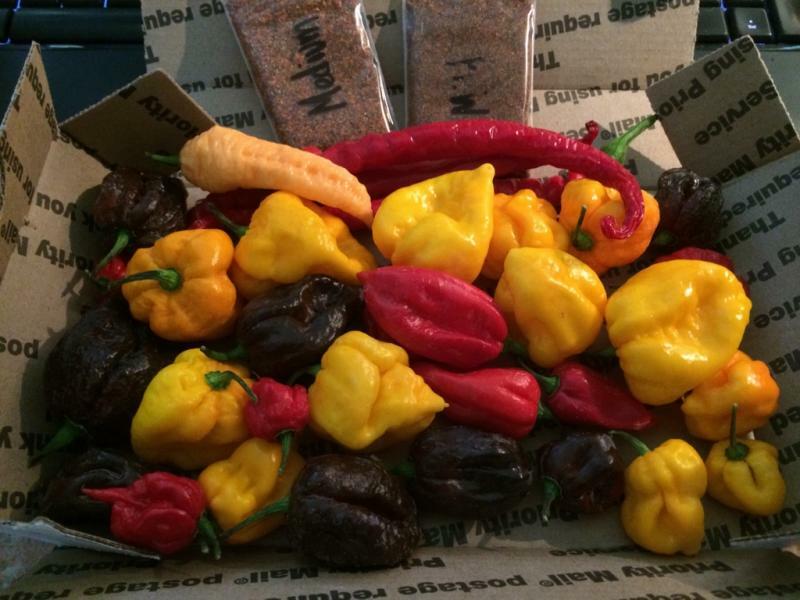 If anybody needs peppers,Wicked Mike is the go to guy.Hands Down,If anyone ask me,who to get peppers from Wicked Mike is who it will be.Mike's products are rock solid good and brings some really good heat.He is like Santa with all that stuff he puts in those boxes. 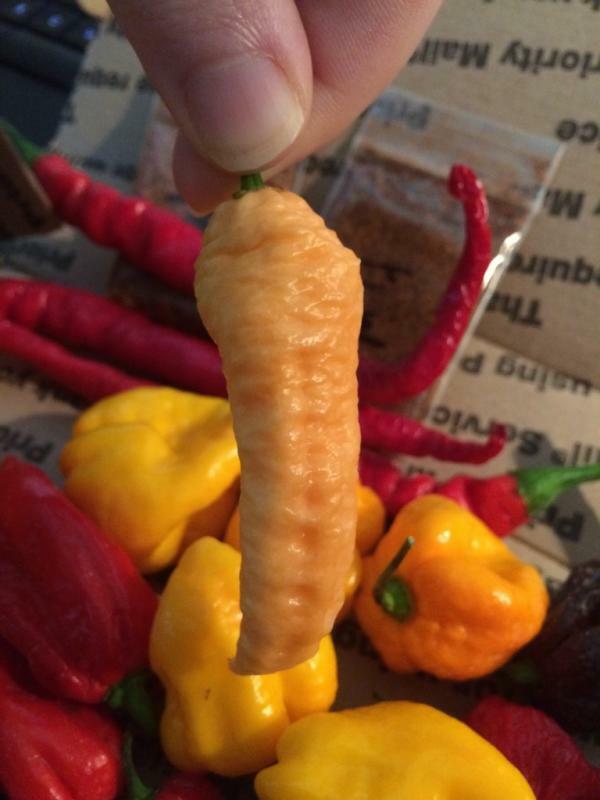 It's such a small pepper,How hot can it be? I can personally vouch for Mike's peppers - outstanding fresh quality, and good varieties too. 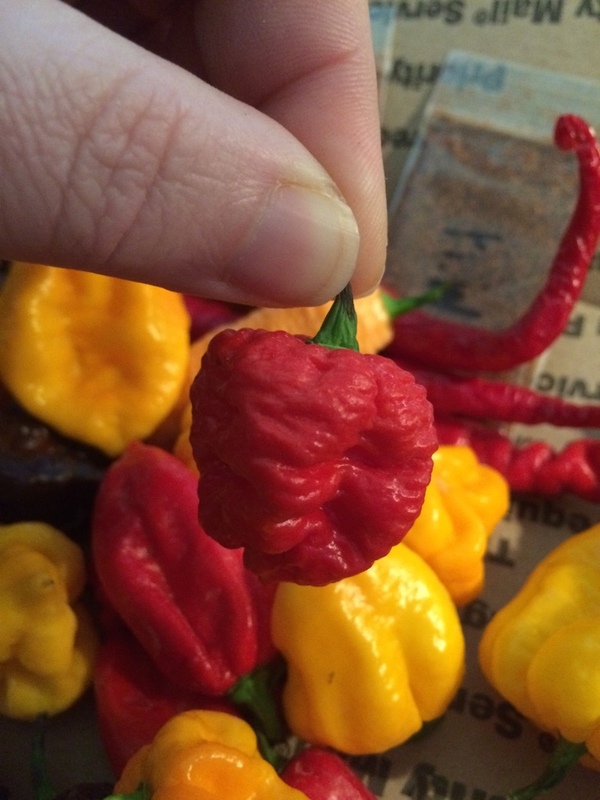 My last box had some 7 pot gigantic SR chocolates that flat out slayed me, along with a nice mix of other sweet pods like aji lemon drops, peach bhuts, habs and the like. That Sunshine State is more a syrup than a 'hot sauce' but he really did hit a home run with that sauce's balance and flavor; a nice initial sweetness redolent of the fruit that fades into the perfect amount of heat on the lips. Mike said put it on pancakes (was good) but I say drizzle some grilled shrimp kebobs with it! Solid dude, excellent addition to this community! Hell yes shrimp and scallops baby I'm all over that!! Finished his bottle of Pumpkin Hot Sauce at Thanksgiving. Outstanding! You should try his powders or rubs. This guy knows how to work with peppers and spices to create some very spectacular flavors. What is Wicked Mikes website called or the link? I Googled Wicked Mike and it keeps bringing up links to this website. Thanks! Never sacrifice flavor for heat. Wicked Mike is such a cool guy. He has the kindness to send me a free box of peppers when i made the mistake of ordering from bakers. I will definitely be buying some from him in the future! Wicked Mike does rock!! !he is awesome!!! I traded some seeds with WM. I don't know how but I had a lot of varieties he didn't. He traded as many back or more and threw in some fresh pods, awesome beef jerky, other types of seeds for all kinds of stuff and some incredible spice blend. 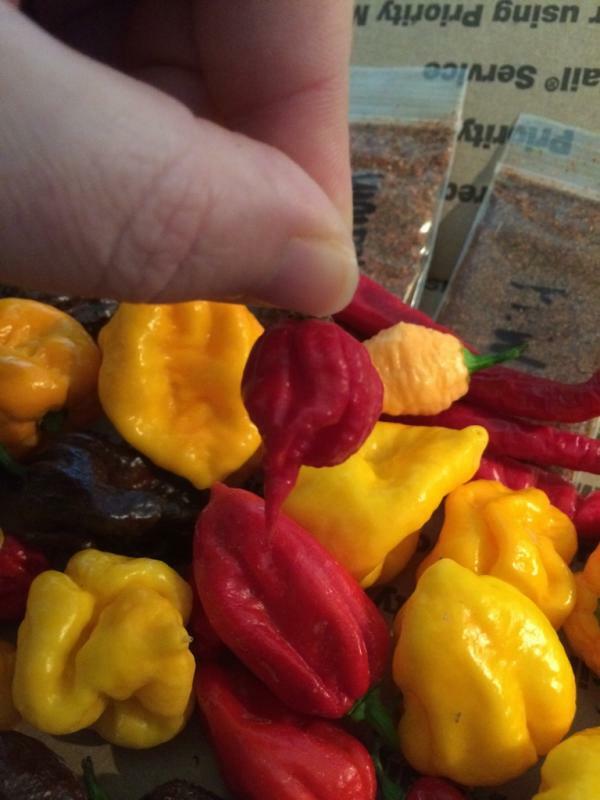 From reading above, glad to see I wasn't the only one who thought those chocolate sr peppers were brutal. WM rocks. 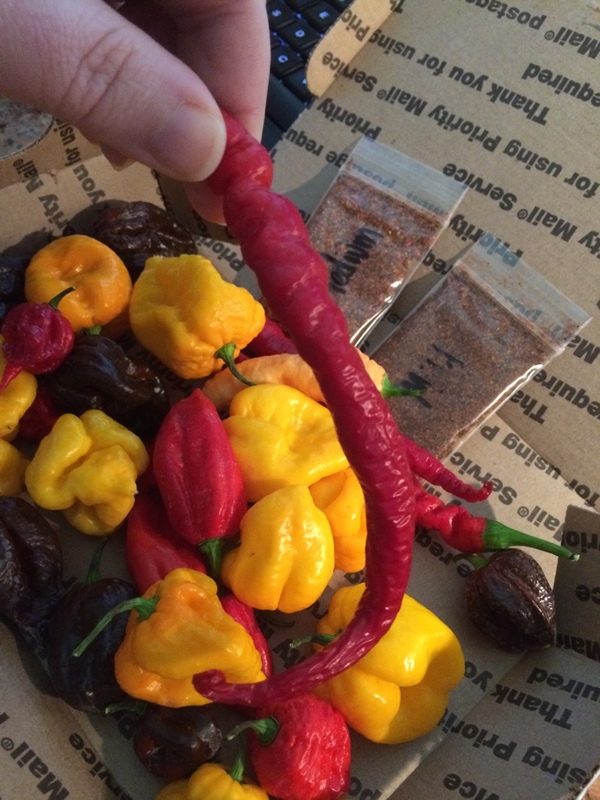 You guys are the bomb, and one hell of an inspiration to keep doing this crazy pepper thing. "Virtute enim ipsa non tam multi praediti esse quam videri volunt." When you treat people right like you do and provide the products you have, there is nothing anyone can do but give you praise. Was a pleasure to meet you. When you start getting some new varieties of fresh pods ripening, let me know. I want to order some in a few weeks to a month if you have any available. I just want to say what a generous & caring man wicked mike is! He is truly one of the coolest people I know . He most certainly does rock! Thank you wicked mike for helping a brother out I am forever grateful to you. That's really nice of you to say, especially since I haven't gotten your seeds out yet. It'll be worth it when it gets there, though. Going to try to make it to the post office after work today. Edited by Wicked Mike, 09 March 2015 - 03:04 PM. I've heard and read nothing but great stuff about you and what you do. You're the best. I hope to have a future chance to interacte with you. Thanks for going above and beyond and picking fresh peppers Monday!